See my remote oil filter at about the 11:00 position well I don't like it on account of the filter is upside down which makes it impossible to prefill the filter on an oil change and also I have hoses the snake all the way down two sides of the engine which is not good imop . so that said I looking for a better spot or a better way to mount the remote filter. What are ya'll doing with the remote filter? BTW I have not tried this yet but if I can access the stock Chevy position and simply spin off and spin on a new filter I will happily scrap the remote as unnecessary. Anyone not running a remote? It's all about access.Your remote can be mounted anywhere and in any position as long as the hoses reach.Personally,I'd leave it where it is,if it was a problem,that 30+ year old motor would have quit long ago. I'd leave it alone. I don't know of anyone who pre-fills an oil filter. It may look like a bad idea being mounted upside down, but the reason is that it allows all of the oil to drain out of the filter on engine shut down. When you take it off, you don't have to deal with a filter full of oil that needs draining. party marty and muskamoot like this. The supply hose to that filter can't be 30 years old. Is it a barbed fitting with push on hose or possibly just looks that way in the picture? If you're worried, after changing the oil pull the coil wire and turn the engine over for a short bit. That will fill the oil filter and you are ready to run the engine. You could re-locate it but what problem are you trying to solve? Do you get low oil pressure right after a cold start? If so it may be worth it but most filters have an anti-drain back valve to prevent the oil from draining out after the first start following an oil change. so you can do as advised (dis-able the ignition after the oil change, crank it till you see pressure on the gauge and then re-connect). Many Mercruisers are set up the same way as yours, filter is upside down like that on a bracket bolted to the exhaust elbow. 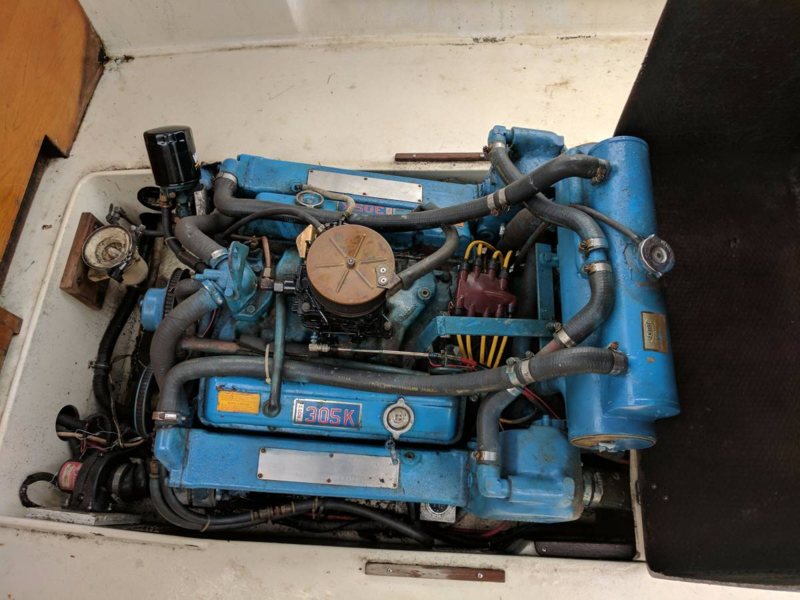 It isn't actually a problem, but have a look at any of the MerCruiser V8s. Mounted on the port side with hard lines most of the way, you could use the whole MerCruiser setup and just make a bracket that bolts to the front of th head fairly easily. Other than that, just get new hoses made for yours, put it on the port side up the way you want it. Chris Craft Cutlass likes this. Jegs or summitracing has remote oil filter relocation kits (generic, probably 5/8 line (-10AN)). Then you can mount it wherever you want. I'd get new hoses made instead of extending the existing ones.